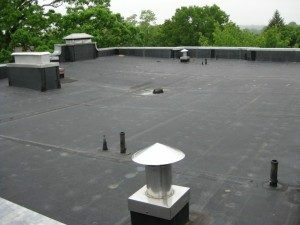 EPDM commercial roofing (Ethylene Propylene Diene Monomer) is usually used in single-ply roofing since it is readily available and easy to apply. It used to be associated to moisture gain problems under the membrane as well as seam problems. However, these have been easily addressed by adding a vapor barrier to resolve vapor drive problems and the use of Factory Applied Tape, which now comes pre-applied to one edge of EPDM rolls, for the seaming problems. The use of these tapes has reduced labor by 75%. The use of EPDM roofing is low-cost compared to other roofing materials, but this does not affect the quality of the membrane. In fact, if applied to appropriate places, its life span can reach up to fifty years with thirty years warranted life span. epdm rubber roof 600×450 slideshow 300×225 EPDM Commercial RoofingThere are three installation methods for EPDM roofing. It can be ballasted at 1,000 lbs/sq. or 10 lbs/sq. ft. Another method is to mechanically attach it. This method is only suitable to areas where wind velocity is not usually high. The last method is to fully adhere it. This is the most expensive among the three methods, but it has proven to be the most durable. Today, EPDM has been combined with a polyester fleece backing. It is also fabricated with a patented hot melt adhesive technology for more consistent bond strength between the fleece backing and membrane. This advancement largely eliminated shrinkage and its ability to stretch up to 300%, allowing it to be more flexible despite the changes in season. Call Montgomery Contractors, Inc. today at (910) 220-2172 for a free estimate.